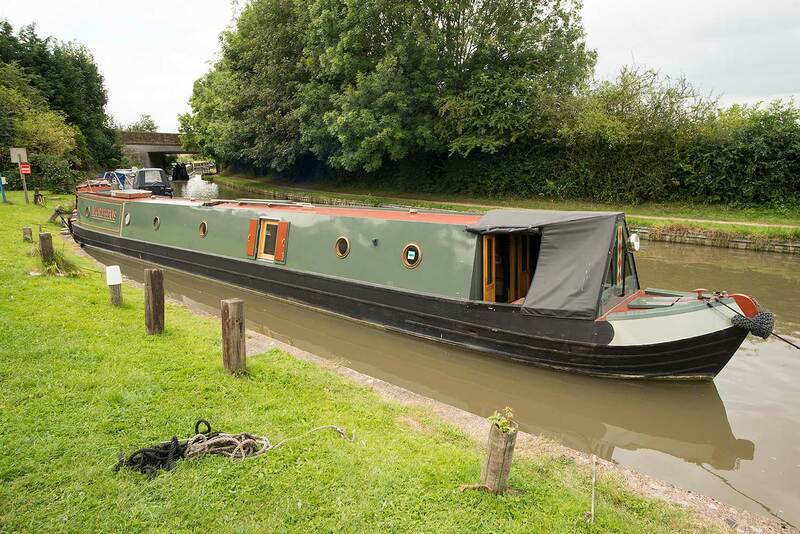 Morpheus is a high quality narrowboat from the Barry Hawkins stable, designed and built for long term cruising and living aboard. The sleek lines of the steel hull contain a fit out that is entirely custom crafted in ash finishes, with copious amounts of storage incorporated. From the bow end, the well deck has glazed wooden doors that drop down into the ample saloon and dinette area. Two free standing armchairs (could be a sofa if preferred) are installed together with a multi fuel stove. Further comfort is provided by an Eberspächer diesel central heating system. At the aft end of the saloon there is a Pullman dinette arrangement, which also doubles as a guest double berth. The open plan galley follows, complete with granite worktops, 5 burner gas hob and eye-level oven/grill. A door opens into the full width walk-through shower room cabin, which has a cassette wc and a modern quadrant shower unit fitted. Next comes the bedroom cabin, which is currently configured with two single berths. One of these extends in width, and it appears that the other did as well but has been altered. A simple replacement of this missing piece would create a king size full width double berth, as I suspect the boat was originally designed. Finally there is an aft cabin which gives a nod to the old back cabins of working days, with a drop down table. Somewhat less traditional but highly useful is the inclusion of both a washing machine and a tumble dryer tucked away in a cupboard. On board power is provided by a bank of 4 batteries, a 3kW inverter and a 3.5 kW engine driven generator. A 45hp Barrus Shire/Yanmar diesel provides ample propulsion.